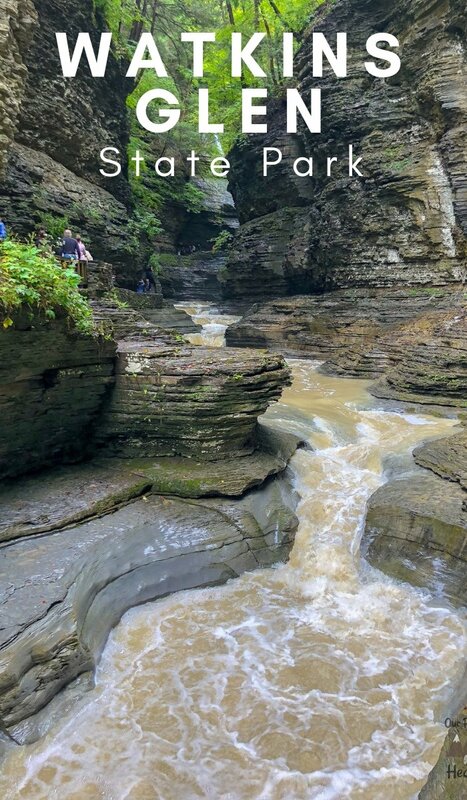 Have you ever wanted to visit a National Park? Visiting as many National Parks as I can has always been a dream of mine. 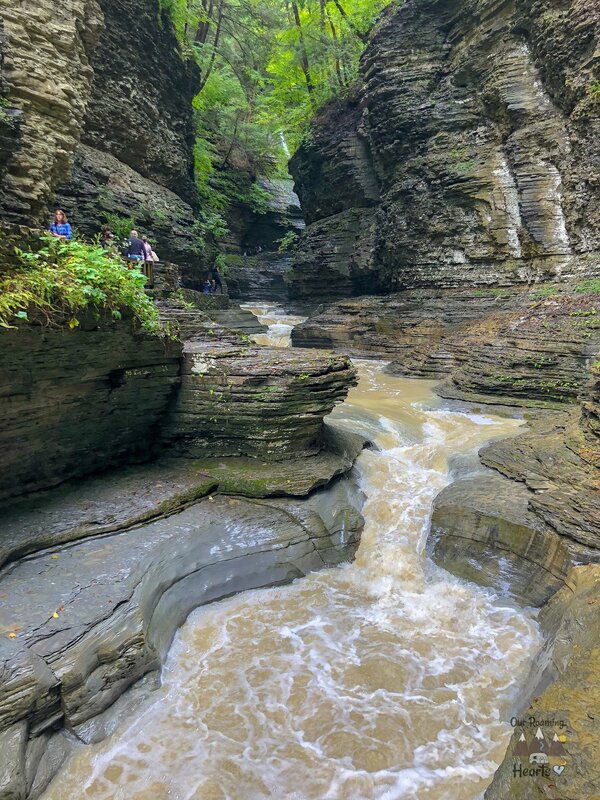 When I found out I’d be able to visit Watkins Glen State Park New York I got super excited as this state park is rated as one of the best in the country. 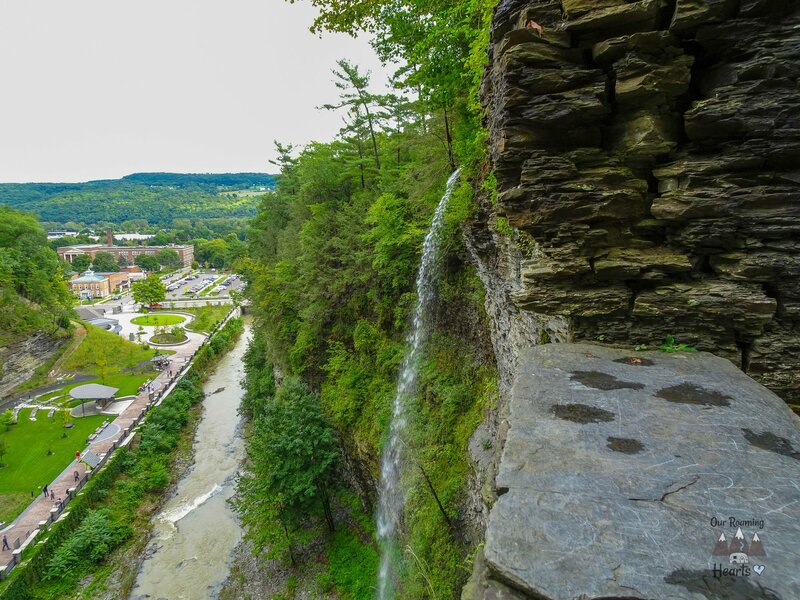 This state park is located in New York and it’s one of the prettiest parks you’ll ever visit. I was staying in Corning when I visited and the drive in was so beautiful, it really is a small town. The day I visited was cloudy and overcast, perfect weather for a hike! 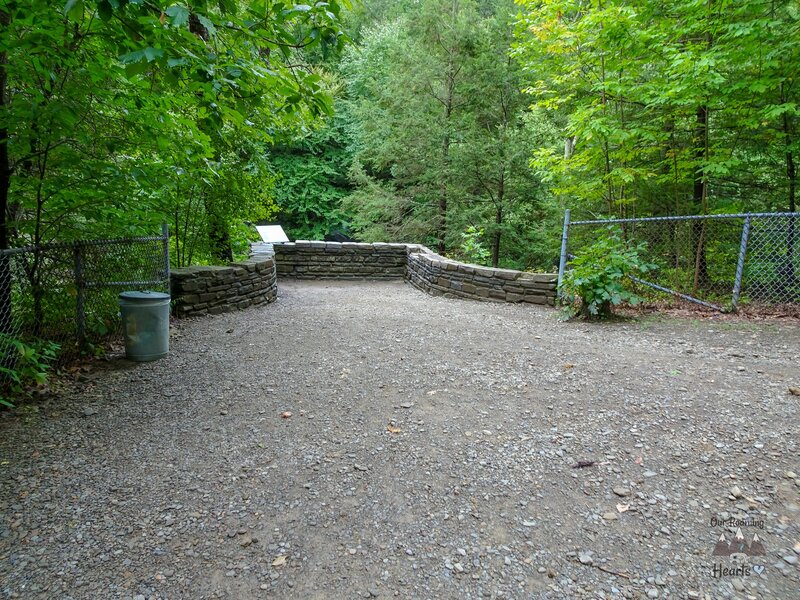 I parked at the Main Entrance (they also have an upper entrance and a south entrance which is near the campground). The visitor center has a lot of information, the park map and the staff are very knowledgeable on the trails. Best of all if you can’t or don’t want to hike you can see two waterfalls just from the visitor center. 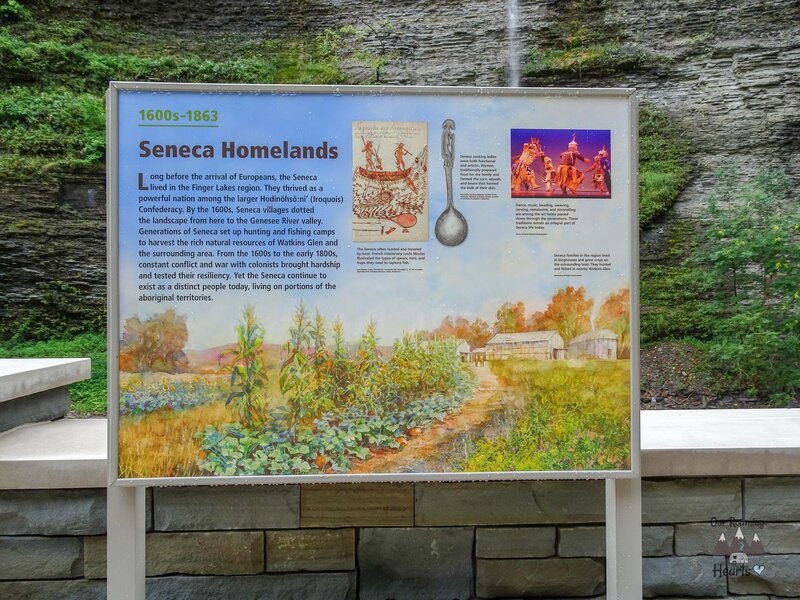 The area by the first waterfall has a lot of the Native American history of the falls and the area. The first waterfall is tall and thin and there are a lot of open areas to have a picnic and bench to sit on, both covered and uncovered. The second waterfall you can see from the visitor center is smaller and but much more powerful as its the river coming out of the gorge. 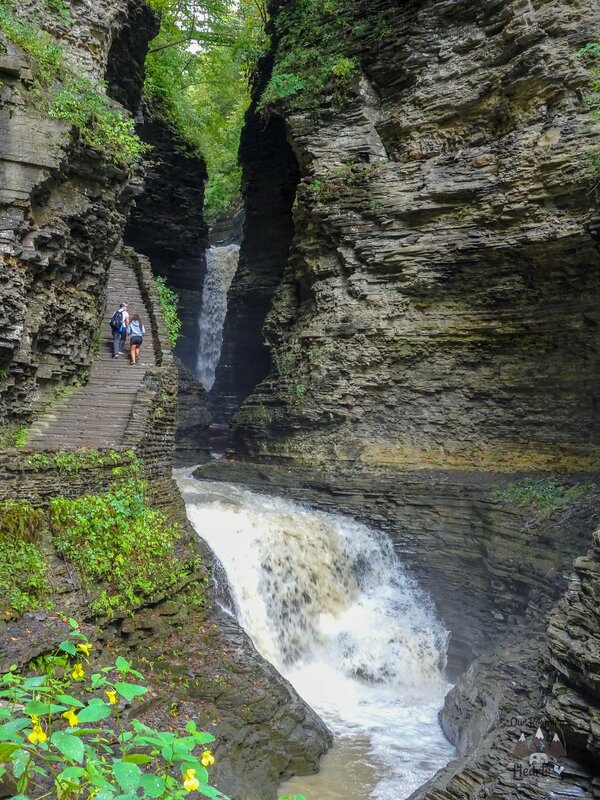 Watkins Glen State Park was named the 3rd best state park in the country by USA Today. The park that took home first place? 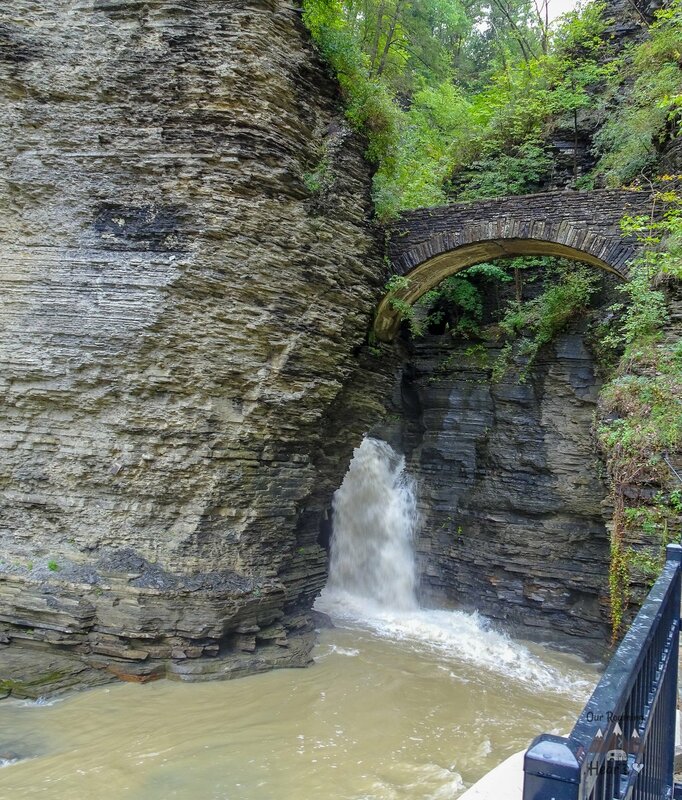 That would be Letchworth State Park, also in the New York Finger Lakes Area. 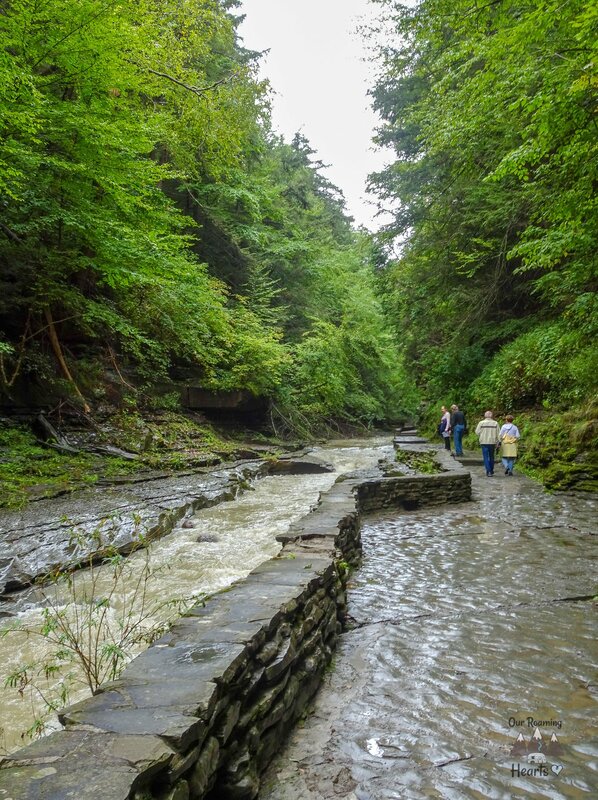 One of the first hikes I took at Watkins Glen National Park was the Gorge Hike. This trail loop, including the Indian Trail Loop, is around 3 miles round trip. 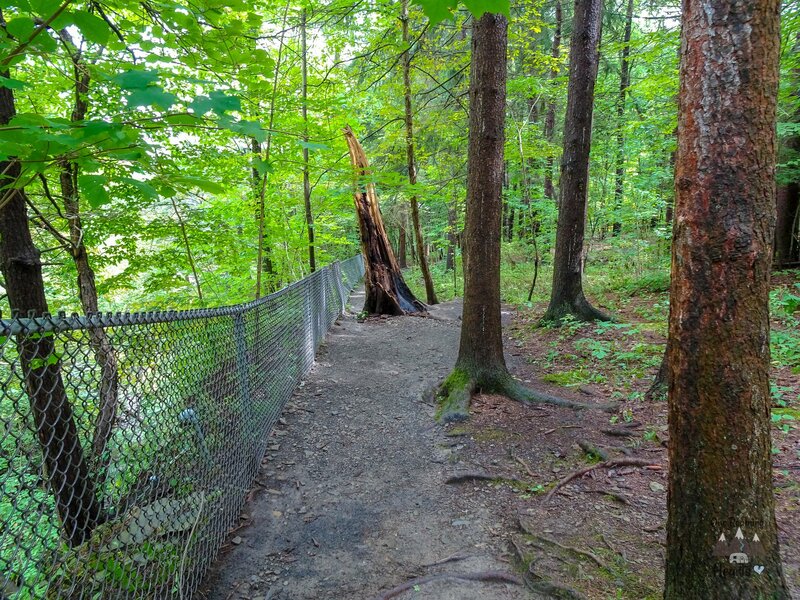 This trail is full of hikers, which is great because I LOVE seeing all the people on the trail. This means nature is ALIVE! Along the hike, you can see around 19 waterfalls, I tried to take as many pictures as I could because they were beautiful! 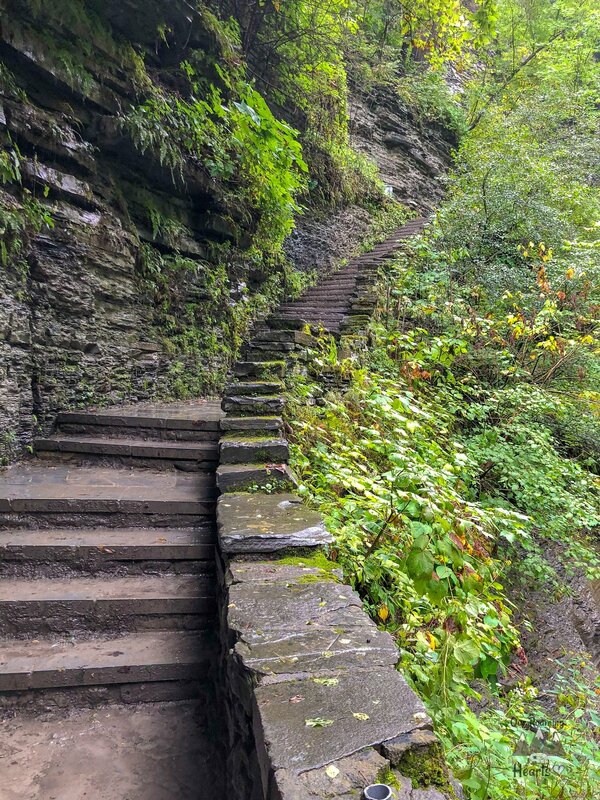 The trail features stone steps and spectacular views that you won’t see anywhere else. 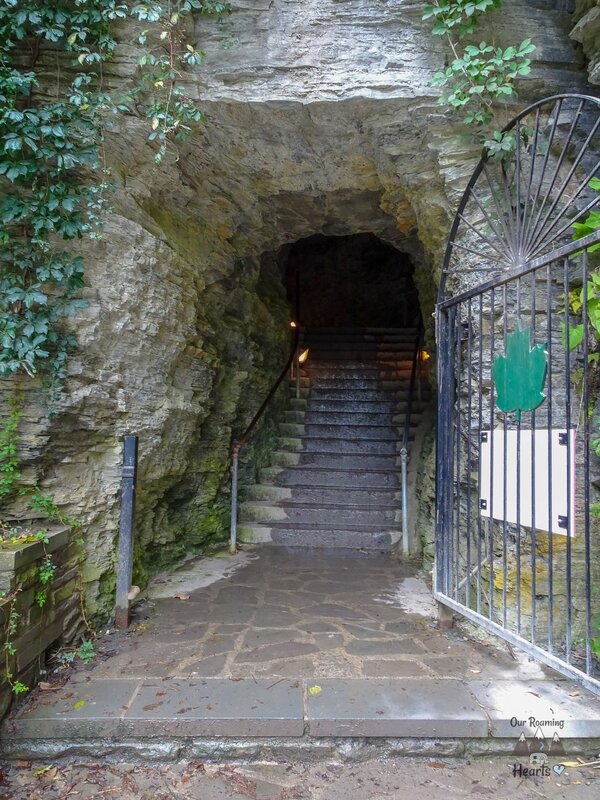 To start the hike you enter the entrance tunnel, this is the first of the 832 stairs you will climb. From here you cross the bridge over the river you saw from the visitor center. From here all I can say is get used to the stairs. There is very little flat service to walk it’s mostly stairs. You don’t notice it so much because there are so many stops to take everything in! 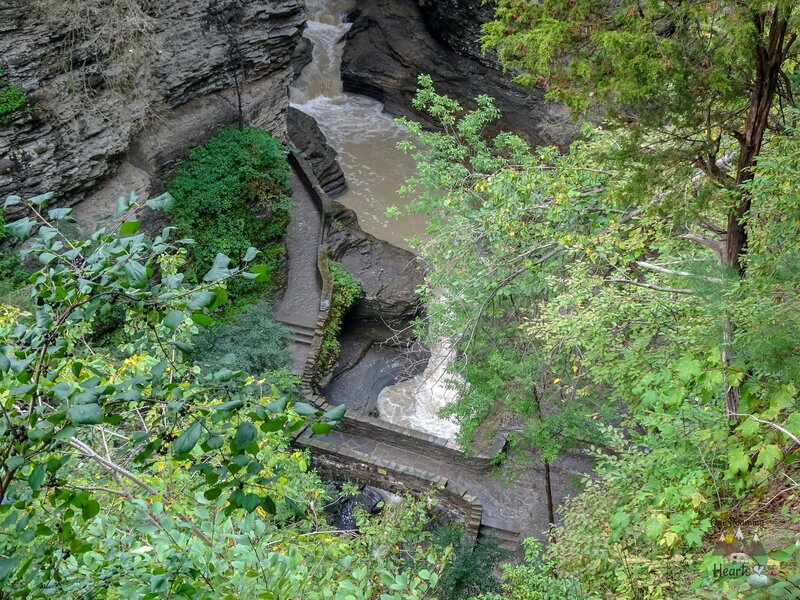 From here you hike the stairs along the river through Cavern Cascade and the Spiral Tunnel. 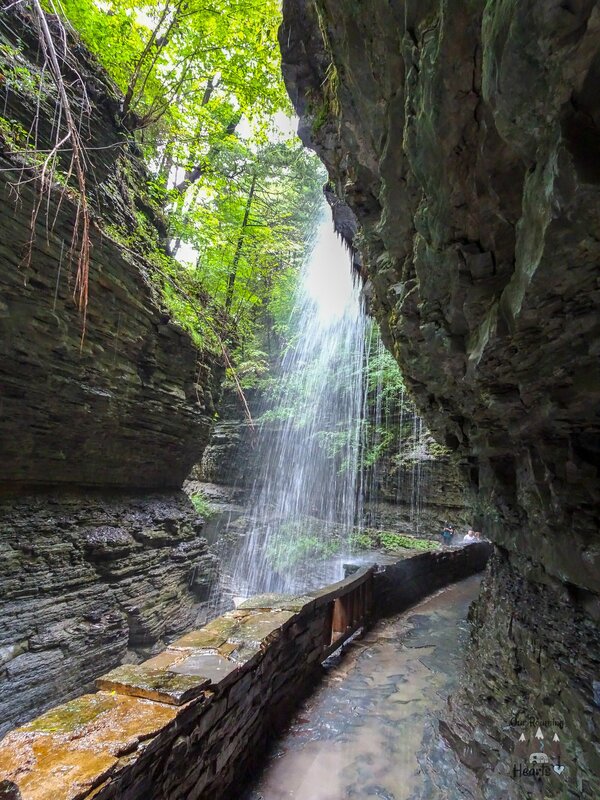 This is where you get to walk under one of the bigger waterfalls! You can see more of it in the video in this post below. You do get a few reprives of constant climbing where there are flat surfaces as you hit The Narrows. Next up on the trail were The Narrows, another beautiful spot of this park. 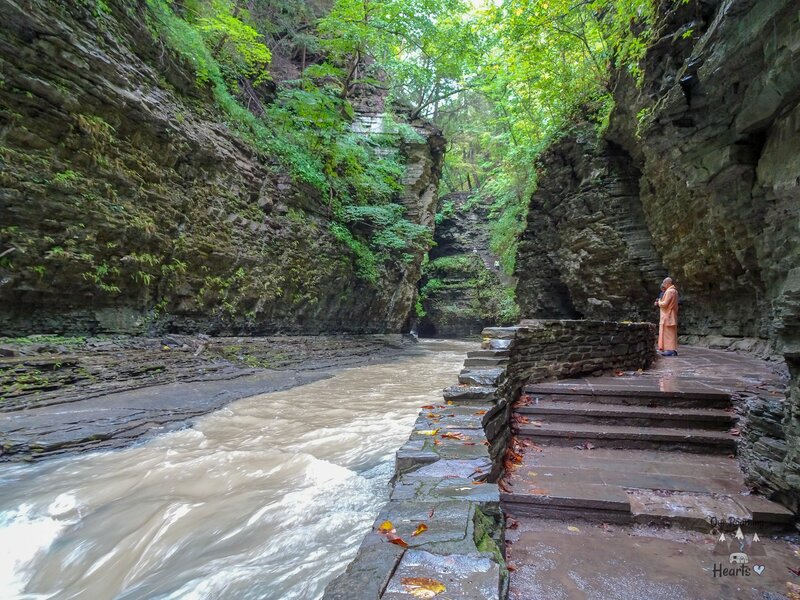 The Narrows gets its name from the narrow area in which the water flows. The Narrows can be seen, right from Gorge Trail. This is one of those natural places that you need to see for yourself. There are plenty of stairs here too. Lots of them. My legs were killing me already by this point but trust me the best is right around the corner! 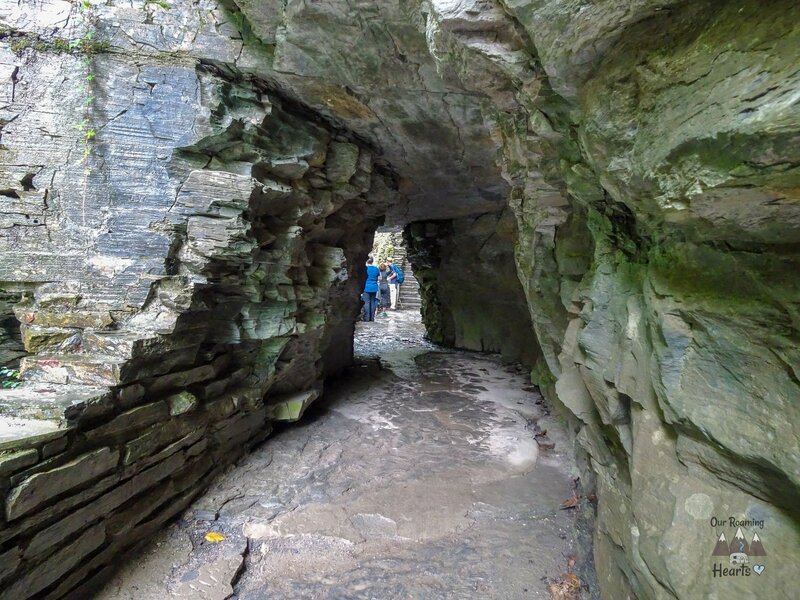 Oh, there is a fun neat tunnel in the rock here too. If the day is hot it a great shady place to cool off if needed. The day I was there it wasn’t needed so I was lucky. 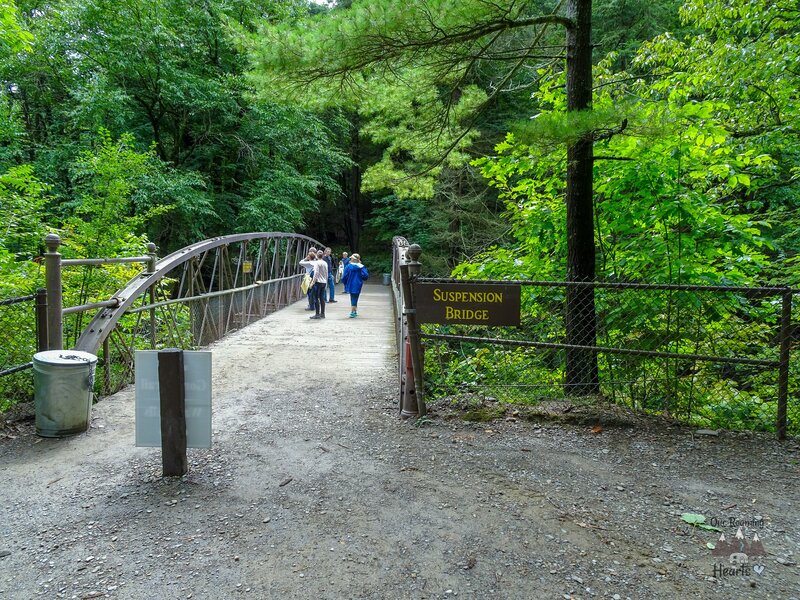 From here you hike Glen Cathedral then when you see this bridge it’s time to get excited. Why do you need to get excited? Well, this is where you enter Rainbow Falls one of the most gorgeous spots on the trail. 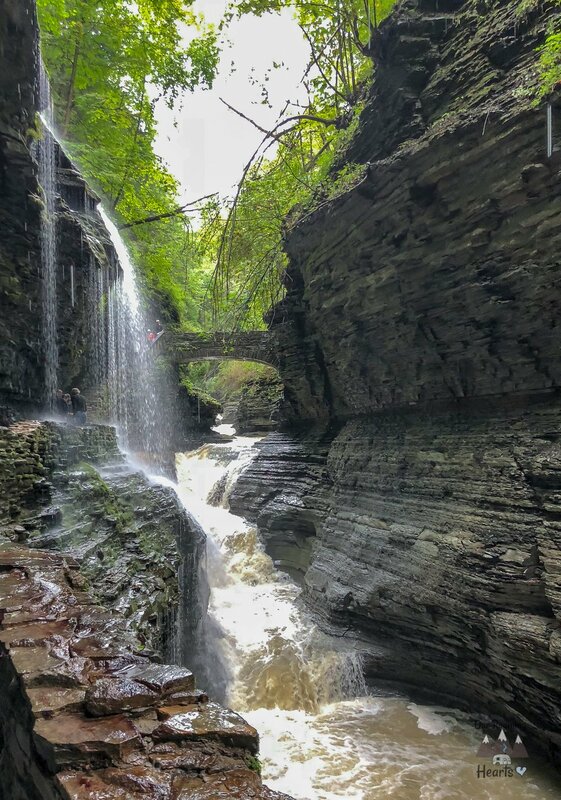 When you see that most photographed famous waterfall that is shown with all the Watkins Glen State Park pictures? This is it. You get your first views of the are with the small water dips. 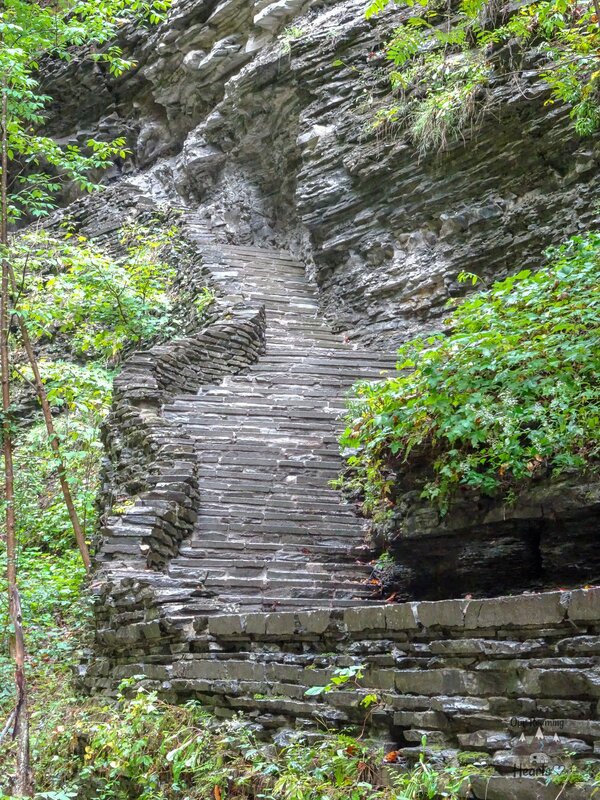 Then you enter Rainbow falls, and of course, there are more stairs! Then you get to see the famous rainbow fall waterfall and continue on under the waterfall. This one gets its name because on a sunny day in the later afternoon rainbows dance off the waterfall. As you continue on your cross the bridge to go over the rive and you get a whole other view of Rainbow Falls. 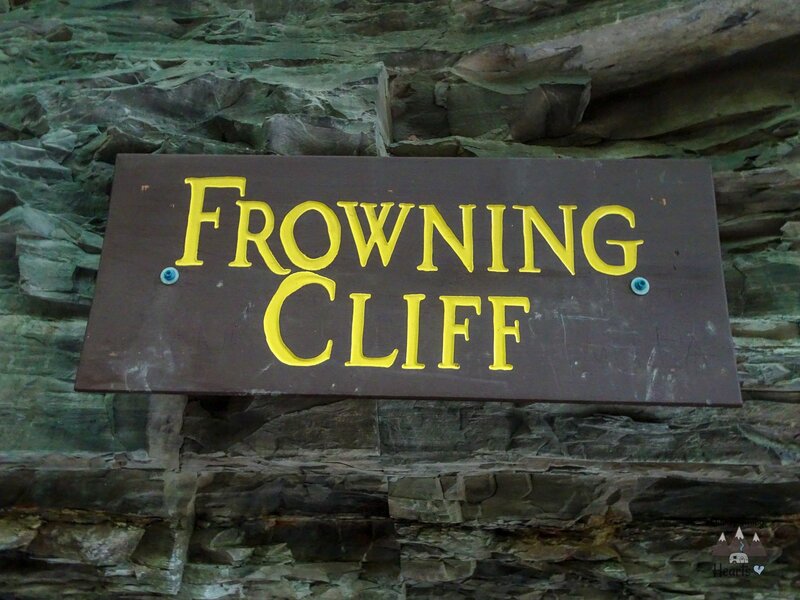 From there you head on into Spiral Gorge and by Frowning Cliff. Here you get a slight break from the stairs. 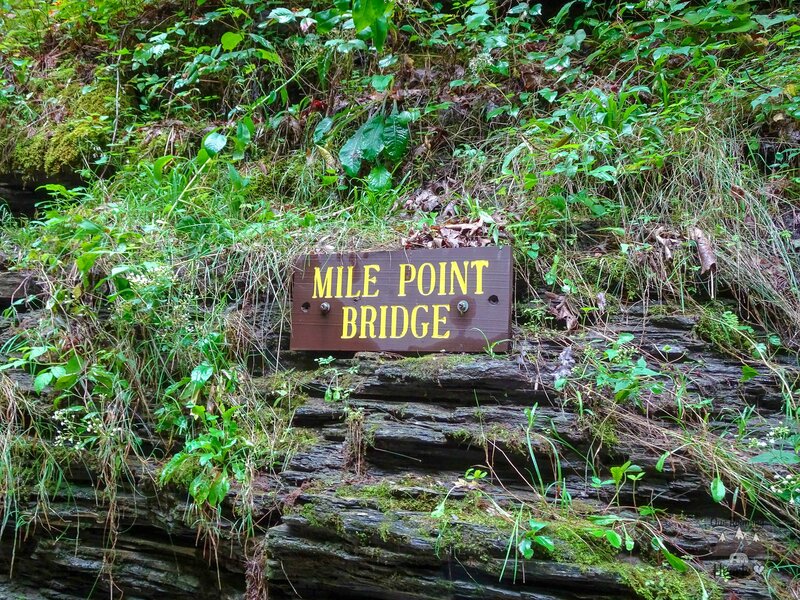 This is you mile marker and from here you can take the bridge to the South Rim Trail, head toward the camping area, cut off toward the Indian Trail and head back or continue on the Gorge Trail which is what I did. After Mile Point Bridge, it’s kind of a flat hike for the last half mile of the trail. It’s calm and peaceful and it had me thinking the stairs were over with. I was very wrong. 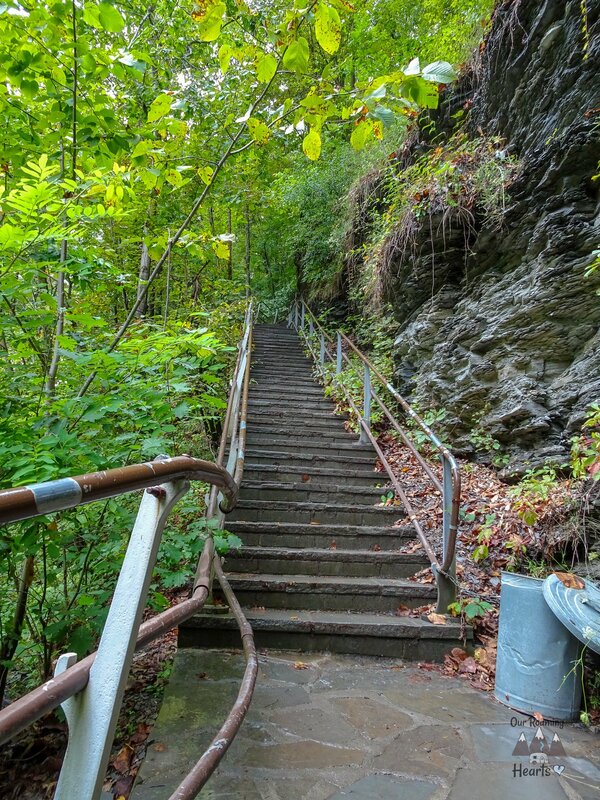 It’s a great hike until the you get to the Jacob’s Ladder. It’s the last 180 stairs straight up. My legs almost gave out I’m not joking! I visited on September 11, which was after the season, so the trams going from the upper entrance back to the main entrance were closed. There was a snack shack too, but also closed! 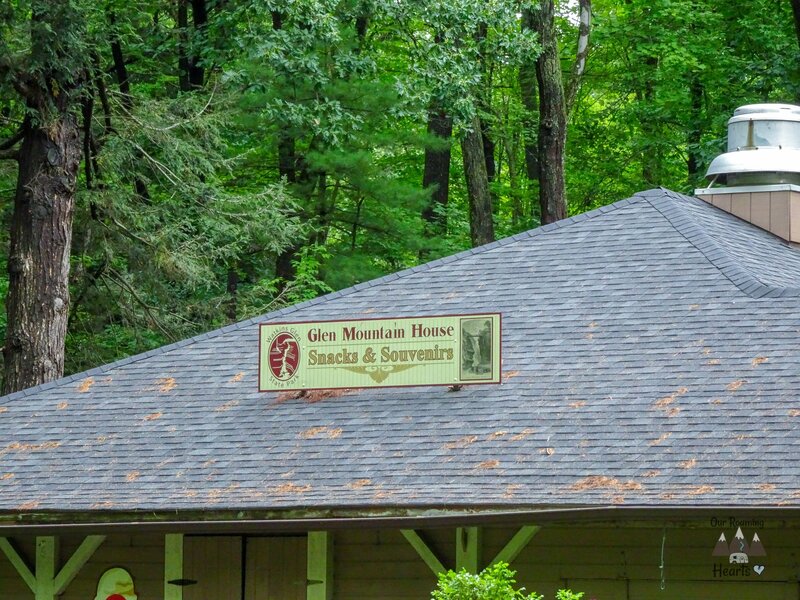 Also, up at the upper entrance is a playground for kids and a great picnic area and bathrooms too! 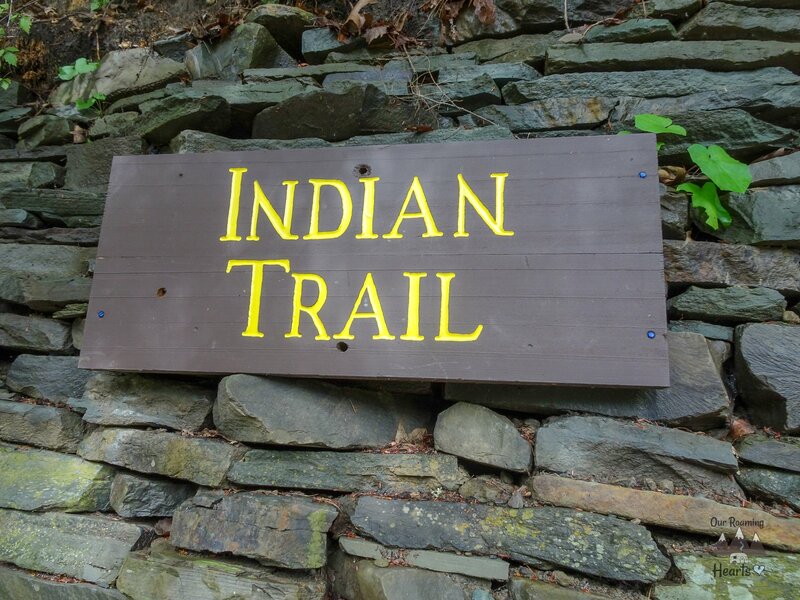 On the way back from my hike, I took the Indian Trail, which is more of a dirt trail. 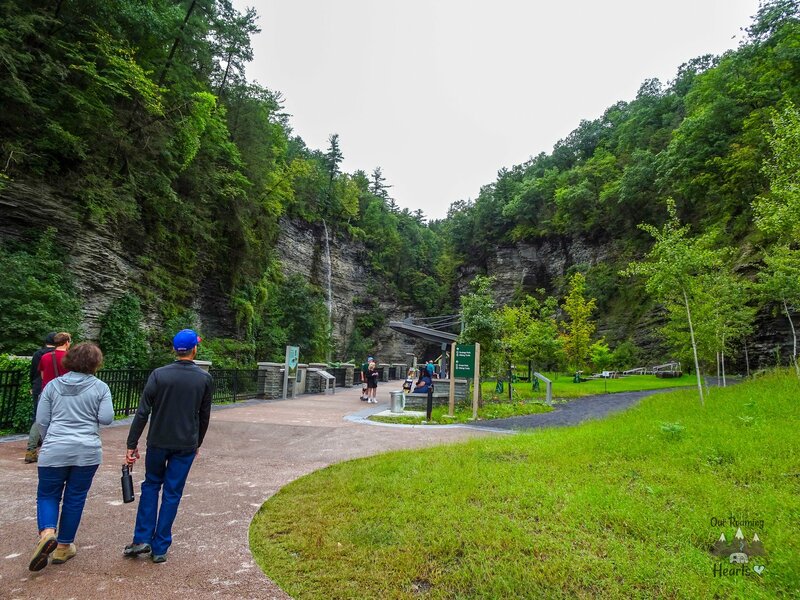 It runs along the upper part of the Gorge and it pet-friendly and a much easier hike. I stopped at some of the special places on the map to see the scenic spots. 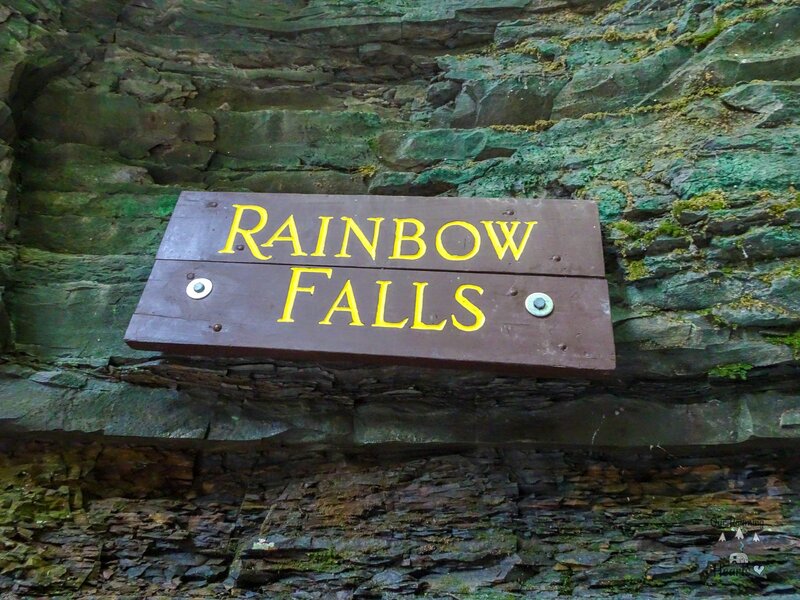 One of them being Rainbow Falls of course. You also get some amazing views of the river and Gorge Trail from above. 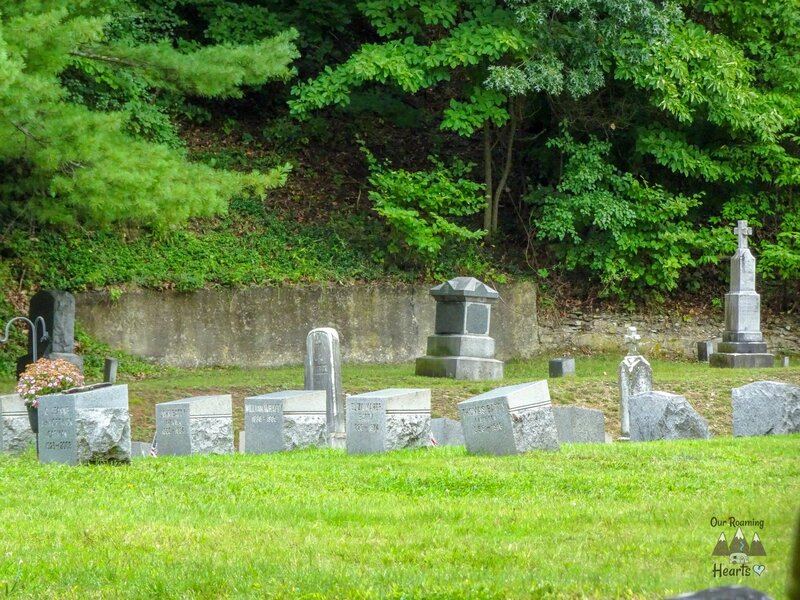 Along the Indian Trail, you pass a graveyard which isn’t on the map but is very beautiful. 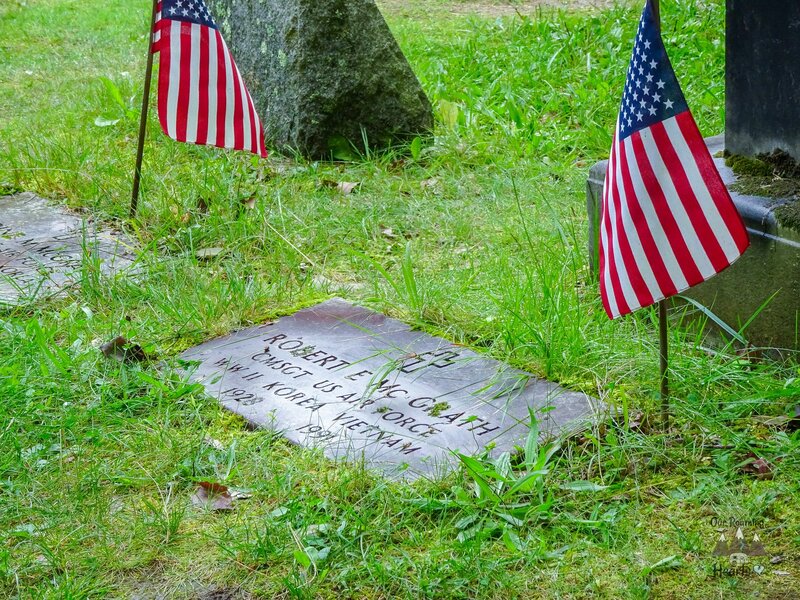 Since I was there on Sept 11 they had flags out at the military headstones and it was very beautiful and somber sight. 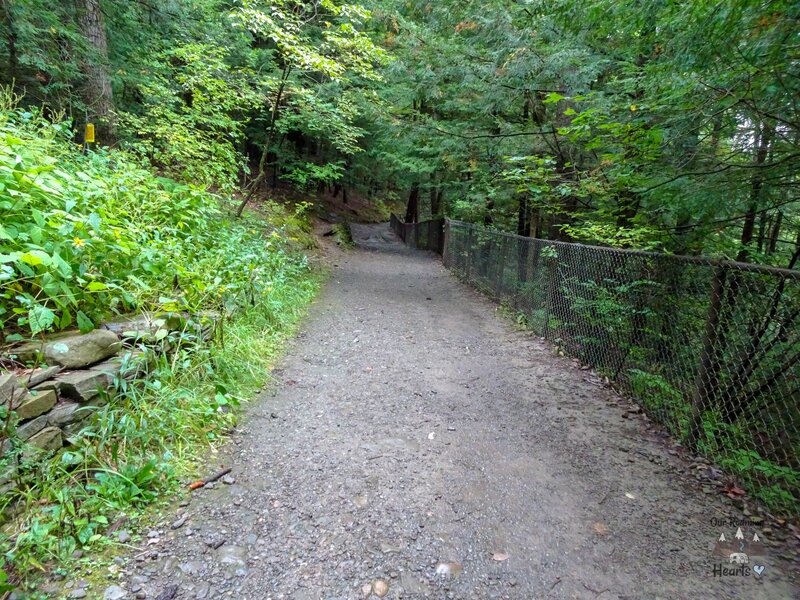 Keep in mind that Indian Trail is kind of steep in some points on the way back down but the Indian Trail does allow dogs, while the Gorge Trail doesn’t. While hiking on the Indian Trail, I thought my fear of heights would keep me from enjoying the suspension bridge, but it didn’t. After the Suspension Bridge, you have a few choices. You can go straight on to Lily’s Pond or even take the first left and head back to the main entrance like I did. This path is something else there were huge trees making you zig zag. Something that really caught my eye was the Couches Staircase. 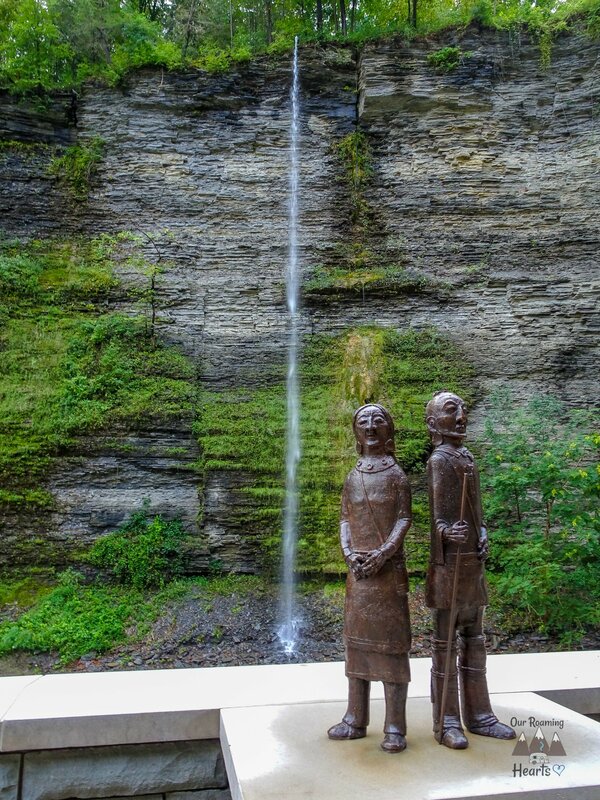 You can some amazing views of the visitor center and part of the town and that first waterfall you saw going in. Couches Staircase was dug into the side of the mountain, which equaled for some VERY steep stairs. 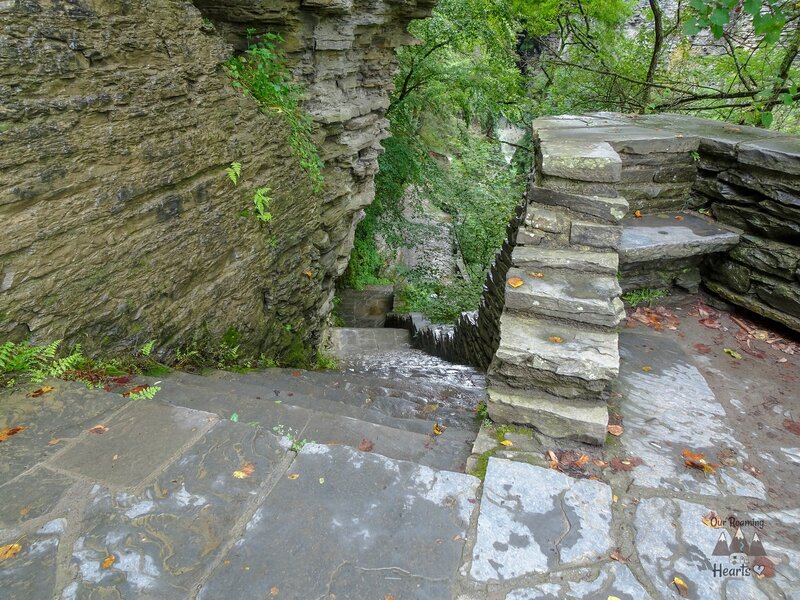 These steep stairs will take you back down into the entrance tunnel, right back down to the main entrance. 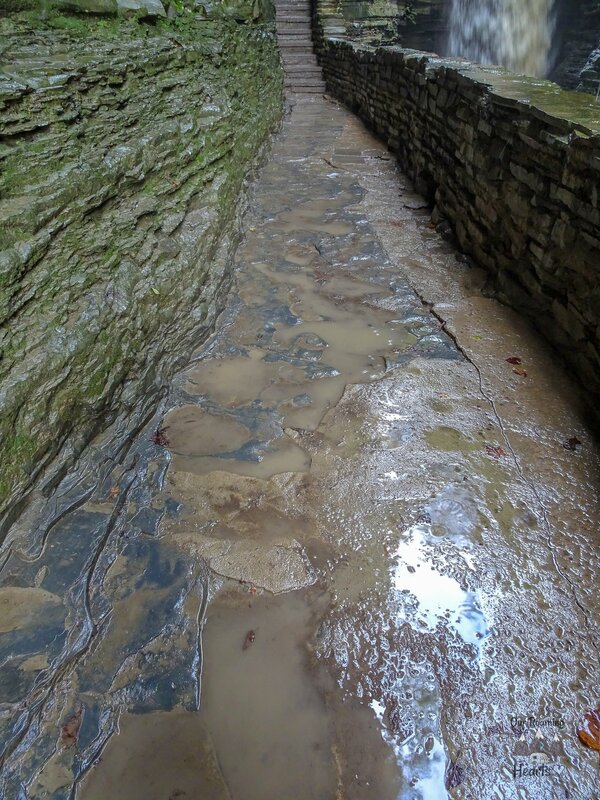 From there you can start the trail all over again or go explore the visitor center. 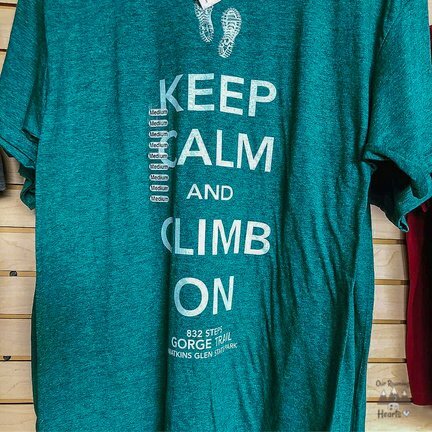 They have a cute little shop there where I picked up this shirt. They also have a small cafe with all local food. I grabbed a sandwich that checked my phone since I had phone service again, most of the hike I had little to no service. 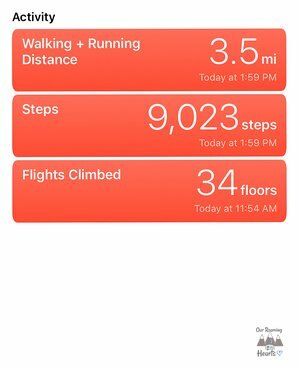 I noticed the hike was 3.5 ish miles but 34 flights of stairs. Holy Moley did my legs hurt for days! All in all, I loved the hike. I told hubby I want to camp at the park next time we are in the area. 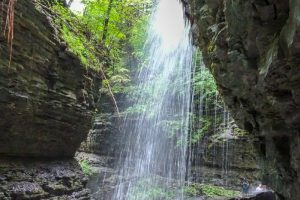 Below is a video of 3 of the waterfalls, including Rainbow Falls, and what it’s like to walk under the biggest one. 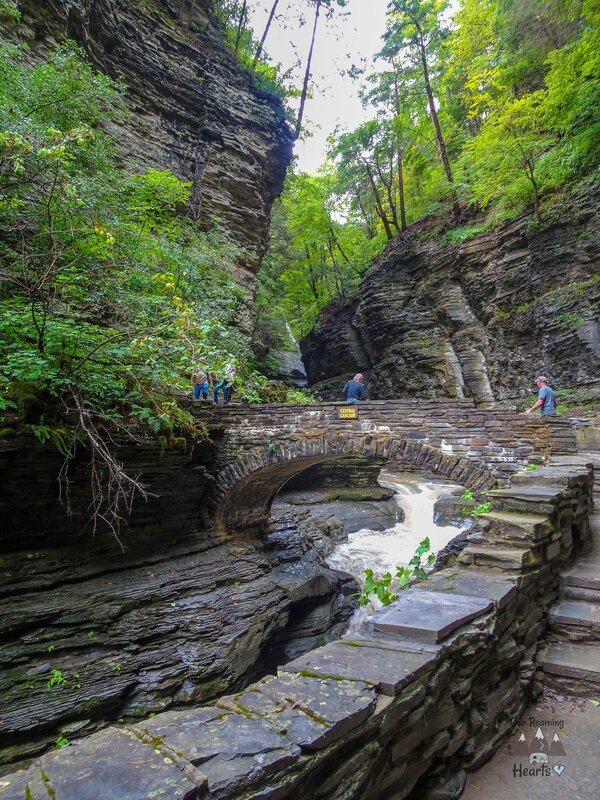 Have you visited Watkins Glen State Park, New York? I’d love to know your thoughts in the comments below!